What is considered rich? See what Americans said. What does it mean to be “rich” in America? It turns out, the answer is as much a matter of perception as anything else. With answer options that range from “$100,000 or more” to “$10 million or more,” the results ran the gamut and demonstrate that Americans’ perception of what is considered wealthy varies widely. 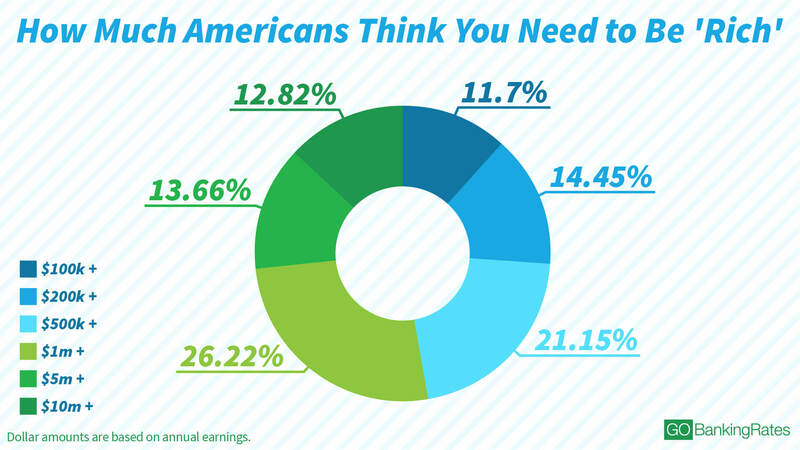 Read on to see what it takes to be considered rich in America. One takeaway from the poll is that the magical appeal of the nice round figure of $1 million appears to hold true, with more than one in four respondents saying that you have to earn at least $1 million a year to be rich. While 26.22 percent of people polled say that earning $1 million a year means you’re rich, another 47.3 percent responded that you don’t need to hit that threshold. The second- and third-most popular answers are both under $1 million a year, with more than one in five people polled saying that a half-million dollars a year or more makes you rich. After that, $200,000 or more is the third-most popular response, at 14.45 percent of the poll. There is a surprising number of people, though, who believe far more income is required to call someone rich. Some 26.48 percent say that even $4 million a year in salary doesn’t cut it. Combine that with the respondents in the $1-million-or-more camp, and you get a solid majority who don’t view anything less than $1 million a year as being rich. Q: What level of annual income do you think makes you rich? When you break down the results geographically, it becomes clearer that the myriad opinions on how much money makes you rich can vary by region and locale. – 5 states had ties. 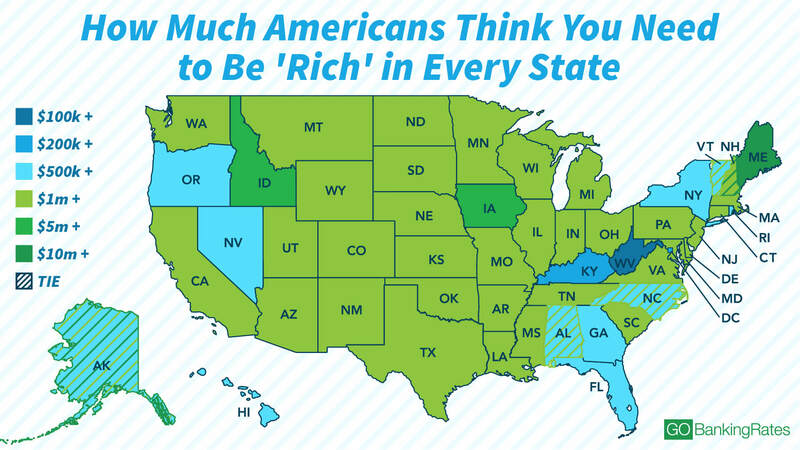 The state with the lowest answer was West Virginia, with “$100,000 or more” as the most common response to the survey. That might not come as a huge surprise given that West Virginia has the lowest median home value and third-lowest median salary in the country. Likewise, Kentucky gave “$200,000 or more” as its most common answer, which could be in line with expectations for a state that was in the bottom 10 for median cost of living, income and home value. However, other responses were more surprising. Only one state had the “$10 million or more” response as its most chosen — and it isn’t one of the high-income, high-cost-of-living states you might expect. It’s Maine, where the median income and median home value tend to be close to national medians. Nearby New Hampshire’s answers were a tie between “$1 million or more” and “$10 million or more,” and five of the top 11 states having the highest percentage of respondents answer “$10 million or more” are in the New England area. This could indicate that perceptions of wealth in the region are higher than the norm. Meanwhile, some of the other states with a most common response under $1 million could raise some eyebrows. Washington, D.C., for instance, came back with $200,000 as its most popular response, despite being in the top five for median income, median home value and cost of living. Likewise, Hawaii and New York are among the most expensive places to live in the country, yet more poll respondents said being rich means earning “$500,000 a year or more” than any other income level. How Many Americans Are Actually Making $1M or More? Overall, one takeaway from the survey could be that there’s a misconception about just how much money other people are making. The reality is that, according to data from the Bureau of Labor Statistics’ Current Population Survey, less than one-quarter of 1 percent of Americans earn at least $1 million a year. Despite this, more than one in four of the people polled would look at a salary of $1 million a year and see someone who isn’t rich in their eyes. An incredible 12.82 percent of respondents answered “$10 million or more,” meaning that they wouldn’t consider someone making $9 million a year to be rich, a potentially surprising result given that $9 million a year would put you firmly in the top 0.1 percent of earners in the country. In fact, earning $100,000 a year means that you only qualify for the survey’s lowest bracket and that some 88.3 percent of Americans wouldn’t consider you rich. In spite of that perception, earning $100,000 a year means that you’re making more annually than 87.9 percent of Americans. What Does ‘Rich’ Really Mean in America? The results of the GOBankingRates survey seem to indicate that most of the country views earning at least seven figures as a necessity to be considered rich, despite the reality that almost nine out of 10 Americans aren’t even clearing $100,000 a year. The results also point to a lack of correlation between factors you might expect to drive a higher perception of being rich in certain states. Some of the states with the highest costs of living and incomes had popular answers that were surprisingly low. On the whole, it’s clear that Americans tend to have very different ideas about what rich really means. That said, most people would agree with this: If you’re pulling down $1 million a year, you’re doing pretty well for yourself. Up Next: What Percent of Americans Think They Will Be a Millionaire? Methodology: This GOBankingRates survey posed the question, “What level of annual income do you think makes you rich?” to 5,021 Americans through Google Consumer Surveys from Feb. 6, 2018, to Feb. 8, 2018. The survey has a 4.3 percent margin of error. Is the new American dream actually a reality?